Tiger Woods, right, should build a golf and learning center in Washington, D.C. at Langston Golf Course. Langston Legacy Golf Course in Northeast, opened in 1939 as a racially segregated course for black golfers. Langston was managed by pioneering golfer Lee Elder and his wife, Rose in the 1970s and is manaaged by local legends Jimmy Gravin (Manager-photo below left) and Janice Arrington (Assistant Manager) today. 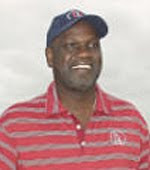 Jimmy Garvin is president of Langston Legacy Golf Corporation, which teaches golf and encourages academic achievement. Langston Golf Course is located near RFK Stadium and the Anacostia River. It is located in a part of the city where many children come from low-income households. Last July, when Tiger was in Bethesda for the AT&T National, Greg McLaughlin, president of the Tiger Woods Foundation, announced plans for a golf and learning center in Washington, D.C. McLaughlin has stated that their key criteria are safety, proximity to public transportation, availability of land and cost. McLaughlin runs a superb foundation and his efforts on behalf of Tiger touched the lives of more than 10 million youngsters through scholarships, grants, the establishments of golf teams and other programs offered by the Tiger Woods Learning Center in Anaheim, California. The center in the District would be the second. Langston, at 26th Street and Benning Road NE, is closer to some public housing complexes than it is to a Metro subway line. Some might see safety and proximity as issues, certainly compared with other possible locations in more upscale parts of the city. But avoiding low-income black communities because they are perceived as unsafe and inaccessible only perpetuates a cycle of socioeconomic isolation. Tiger, in looking for the most ideal location, should favor locating the the learning center in a place that is inaccessible to disadvantaged kids. Garvin and Arrington host many youngsters who are interested in golf because of Tiger. But the window for taking advantage of their interest does not stay open very long.